The Russo-Turkish War 1877-1878 Medal was instituted on April 17, 1878. 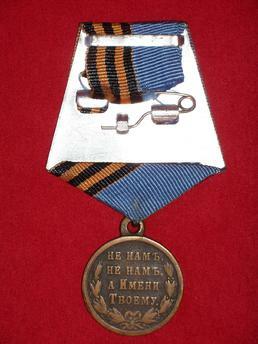 Dark Bronze medal was awarded to all generals, commisioned officers, non-commisioned officers, enlisted men, of the Russian Army and Navy and to Bulgarian Militia. 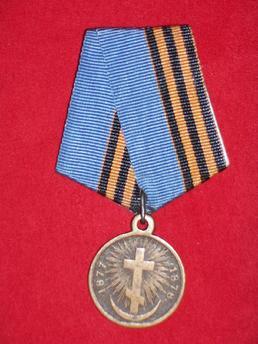 Obverse has a Russian Cross above a Turkish Crescent. To the left of the cross is the date, 1877, and to the right, 1878. Reverse has the Inscription, NOT FOR US, BUT FOR THE SAKE OF THY NAME. The Inscription is framed by two laurel branches tied at the bottom with a bow.